At first, Rachel Vasquez found her new job working for private detective Clayton Guthrie promising. He got her a gun and a license and took her to target practice. But lately she's just been doing surveillance, and it's not her idea of an exciting time. She is contemplating quitting when Guthrie lands an intriguing case that will take all their wits and guts to solve. Camille Bowman, a beautiful blond Columbia student and Manhattan heiress, is found dead, shot by a gun that belonged to her fiancé, Greg Olsen, an Afghan war veteran. Guthrie is hired to prove Olsen's innocence, and fortunately he thinks Olsen smells clean. The detectives return to the scene of the crime, where they see a vagrant who claims he heard the shots and picked the girl's wallet. Tiring of their questions, the vagrant flees, and Vasquez and Guthrie must track a man who's an expert at disappearing while also butting heads with the NYPD, cracking doors at Columbia University, and crawling through the city's subterranean tunnels. To complicate matters, the murder could be part of a spree of killings being called the "Barbie doll murders," in which women are killed for no apparent reason and with no suspect in sight. The NYPD would like to pin them all on Olsen, and his life will depend on Guthrie and Vasquez catching the real culprit. In a race against time, the detectives gather clues that culminate in a bloody chase of one very determined and surprising killer. 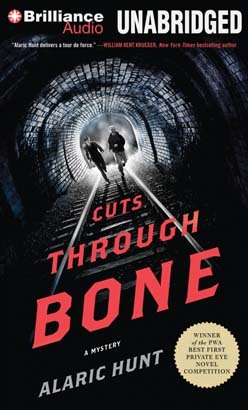 Cuts Through Bone is a suspenseful ride, a novel that is atmospheric, stylistic, and gritty to boot. In Vasquez and Guthrie, youth and brashness meet experience and resolve, making for one of the most intriguing PI teams around. Debut author Alaric Hunt has penned a riveting hard-boiled mystery, a contemporary story with the feel of a classic PI novel and a scope as large and complex as New York City, and even reaching beyond.